Five miles northwest of Lago Vista, a small group of citizens banded together to attempt to establish a post office. After six name suggestions were rejected by the post office the residents replied in disgust, "Let the post office be nameless and be damned!" Thus the town of Nameless was born. 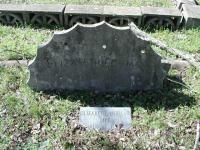 The grave of little Rudolph Kauffman features the oldest legible stone in the cemtery, but it's probably not. Undated stones appear to be older. The small community never counted more than a handful of buildings, most of which have long since been torn down. 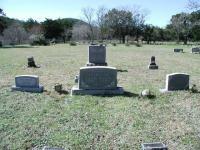 One feature that remained is the Nameless Cemetery, which resides on Nameless Road, just north of FM 1431. On some maps the cemetery is also referred to as the "Fairview Cemetery". The Bolt family section of the cemetery includes a concrete block boundary around its perimeter. Note the Nameless school house in the background. When visiting the cemetery grounds please be extra careful when opening the gates both along the road and to the fence of the cemetery plot next to the old schoolhouse. Horses run free in the area and failure to properly secure the gate as you found it could let them loose. The horses know that the grass in the cemetery area is lusher and they have an interest in getting inside, so be extra careful. The grounds appear to be very well kept, though there was evidence that the horses had managed to get into the cemetery in the past. 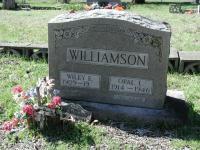 Few headstones were damaged. One had been knocked over and another appeared to have broken into pieces. Interestingly the pieces had been neatly stacked onto its base. 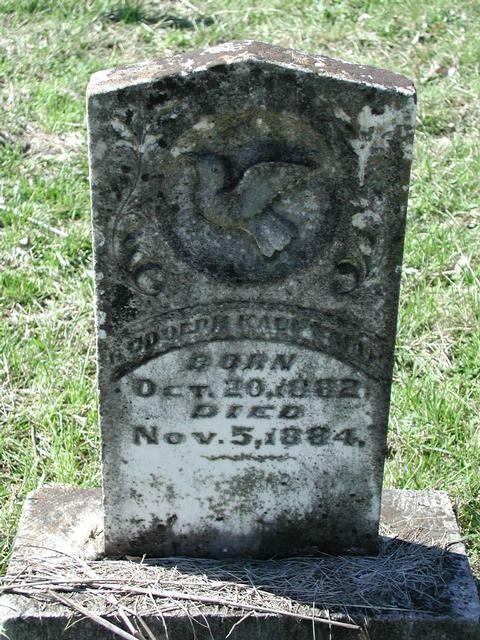 The oldest visible tombstone appears to be that of Rudolph Kauffman, a 2 year old who died in 1884. 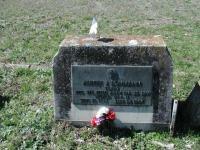 However, the cemetery includes graves with either illegible markers or no markers at all, some of which are likely to be older than that. The Pope family has a number of family members at rest here. Of particular interest is the simple pillar that marks the graves of no less than three Pope children who died near the turn of the century. Some other family names in abundance at the cemetery include Bolt, Hart, Lohman (and Lohmann), Maynard, Pearson, Williamson and West. I really liked the area but was made to feel like an intruder! They don't put out the welcome mat here as they discourage your presence when all you want to do is check out the cemetary and historic school house. If they don't like visitors then they should (LTEEA) probably purchase the property and put up "No Trespassing Signs". Otherwise leave people alone who are just visiting and not harming anything! I thought this area was "Public Lands" supported by Tax Payers? I would have ranked this area higher but the Manager of this area is not friendly to strangers. 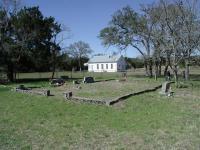 I have visited this site and enjoyed checking out the pioneer cemetary and reading the historical markers. But was told by one of the "Land Managers" who are the LTEEA, that they "don't care to have strangers lurking around the area" and that they only welcome people who have a specific purpose, for being there, on the premises. Such as decorating a grave or attending a meeting in the old school house. Otherwise you're not welcome.